Congratulations on your decision to learn Norwegian! 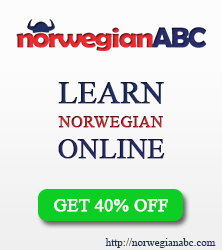 We have honour to present you free Norwegian lessons course. Let’s start from learning new words, how to say hello, to introduce and tell about yourself. Vocabulary. Hei! Hva heter du? Read words and listen how they are pronounced. Try to spell them out loud. Hva heter du? – What is your name? Riktig eller falskt? Answer if the word is translated correctly. You’ll get 10 randomly picked words. This entry was posted in FREE Norwegian Lessons and tagged free norwegian lessons, learn norwegian on July 3, 2014 by norgewp. Actually not bad at all….LIKE IT! !